One of the biggest challenges for any roofing business is generating qualified leads. In fact, it’s a constant battle of testing and throwing things against the wall to see what works. The roofing space, like other trades, is unique, in that their biggest challenge is not sales and marketing but the lack of skilled labor. However, generating qualified leads is the engine that drives new business. In this article, I am going to share 17 ways to generate commercial and residential leads for your roofing business. First, let's define what a lead is. “A sales lead is a prospective consumer of a product or service, created when an individual or business shows interest and provides contact information. Businesses gain access to sales leads through advertising, trade shows, direct mailings and other marketing efforts.” Generating qualified leads is the backbone of most businesses. There are a lot of different ways for a roofing business to generate leads. The strategies have changed over the years, and channels that were once effective don't have the same impact as they once used to have. As a business owner, it’s your job to keep up with the latest tactics and strategies in lead generation. If you don’t have the time then you should hire someone that does. There are two types of leads. Business to Business leads (B2B) and Business to Consumer (B2C). Generally speaking, B2B leads are going to be more expensive than B2C leads. Residential prospects are much less sophisticated than commercial roofing prospects. Think about it, how many times does a homeowner deal with roof repairs? Not much. When you that compare to manufacturing and industrial types of businesses that deal lots of different types of bids, the buyer is much more sophisticated. You also have to take into account the length of the sales cycle in residential vs. commercial. Canvassing is old school but it still works. There is nothing like a face-to-face meeting. The most effective time to canvass is right after a storm. Another old school method that is still effective. Over the last decade, our mailboxes have actually gotten less flooded. The average American now only receives 16 pieces of mail per week. Compared to our email inboxes your message will be much more likely to be read. According to the Direct Marketing Association, direct mail has an average cost per lead of $51.40 for a general mailing list and $54.10 for postcards. Despite all the hype of people saying SEO is dead, SEO is more relevant than ever. It’s a great way to provide valuable content to your prospects and generate leads for your business. There are three sides to SEO. Technical SEO, which deals with your website and the relevant keywords, and content marketing, and backlinking. For local SEO there a lot of factors that will help you get ranked. 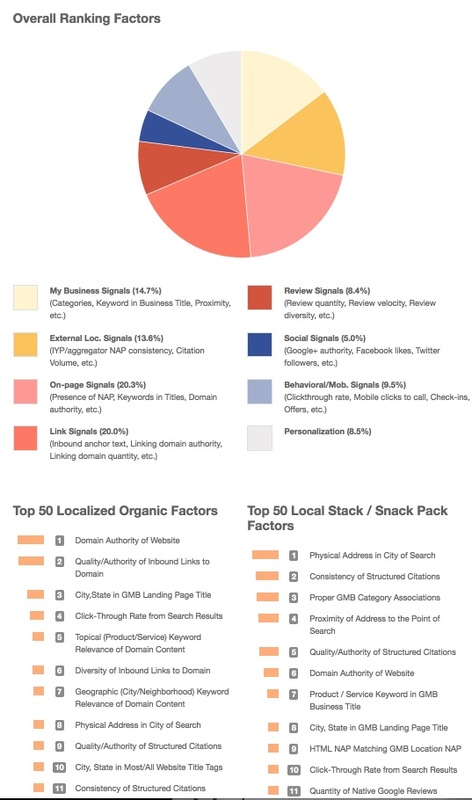 Take a look at this study compiled by MOZ. You don’t have to remember all these factors. It’s important to keep it simple and just start with the most important aspects. Google My Business will account for 80% of your ranking. Google has put together a handy guide that will help you get your business on Google here. Even with the rising costs, pay per click is one of the most effective and fastest ways to start generating leads for your business. You can start seeing leads within a week if you set up your campaign correctly. In the roofing space, you can generate both residential and commercial leads for your business using pay per click. Adwords will consist of the majority of your pay-per-click efforts but you should not ignore Bing Ads. For many businesses, Facebook and Instagram ads are a cost-effective way to earn leads. For roofers, it can work well but you have to have the right strategy in place to make an impact in your business. Boostpoint is a new app from Equipter. Simply enter into Boostpoint the area or neighborhood where you want to do more business, like a development where you already have a roofing job scheduled. Boostpoint’s algorithms then display your ad to the people in that neighborhood most likely to be your next customers. Since those homeowners are probably already seeing your trucks, crews, and signs on the scheduled roofing job, the digital ads make additional impressions so that when it’s time for the consumer to replace their roof, yours is the brand name they remember. A lot of roofers have created partnerships with the dominant suppliers in their market. Suppliers like Lowe's and Home Depot have brand recognition that a lot of small roofing businesses have trouble competing with. There are a lot of roofing contractors that have formed partnerships with these companies and used them to serve their clients. I don’t know what the terms are but if you can get a steady stream of leads using these partnerships than this will be great for your business. I recently spoke to a roofer that told me that he has 4 different storm tracker apps which notify him every time there is a storm in the area. This is a great way to stay on top areas in which storms can cause havoc to roofs. Most people will not even think about their roofs until they have a leak. And most leaks are caused by storms. Stay on top of hot prospects by knowing exactly where the storms are. Content marketing is a great way to build authority and credibility in your area. If you provide relevant, useful, and in-depth content you can generate a ton of leads. A consistent content marketing strategy will eventually start generating lots of organic traffic to your web properties. This is a great way to get people to know, like, and trust you. Every lead generation channel should supplement their marketing efforts with an email marketing campaign. Despite being around for close to 20 years, email marketing continues to be the most effective online marketing channel. For every $1 spent there is $40 return on investment. It's amazing how many roofing businesses don’t have an email marketing campaign set up. You should follow-up with every single lead. Companies that use email to nurture leads generate 50% more sales-ready leads and at a 33% lower cost. You can sleuth the competition, create new business partnerships, create company awareness, and generate leads that convert to more sales. There are two main things to keep in mind when attending trade shows. First, you have to give value first. Make sure that anybody that stops by your booth gets a freebie that attendees will find valuable. You can provide educational content in the form of coupons, giveaways, run contests. etc.. The second thing you should do is to properly follow up. Most sales are made in the follow-up. Over 80% leads generated from trade shows are never followed-up. If the average company spends $15,000 to attend a trade show why would you not maximize your opportunities? It’s very important that you have a systematic way to follow up with all the leads that you generate from the trade show. Attending your local Chamber of Commerce can provide you with an opportunity to network with local business owners. It’s also a great way to meet property managers, developers, and architects all which can refer you lots of business. You can introduce yourself and see if there are businesses looking for your help. Not a direct way to generate leads but having positive reviews on these sites can help your business grow. Your online reputation is one of the most important aspects of your online presence. Most people will do multiple searches of your business before they engage you. It's important that you have the proper tools set up for all the review sites including Google Maps, Facebook Local, Yelp, and Home Advisor. Telemarketing was once a very effective channel to generate leads. It still works but people have lots of tools that block unwanted calls. There are a lot of telemarketing companies that will generate storm leads for you. They can call people and set up appointments for you. I’ve never used HomeAdvisor myself but some of my clients have. They have seen mixed results at best. I can’t speak for myself but this link can show you some examples of HomeAdvisor. It really depends on the trade and the situation. The big negative with HomeAdvisor is that they sell your leads to many business owners in your area. They are not exclusive. I don’t have any experience with Angie's List but I've heard that some roofers have had success generating residential leads from there. Like most of these types of services, the more information your business profile has the better chances you’ll see success. You have to first claim your profile and put as much relevant information as you can. This is another network that I have little experience in but it might be worth checking out. The cost is minimal. You can sign up as a pro here. The key thing to keep in mind in these types of strategies is to completely fill out your profile. Add as many images, testimonials, and description as you can. The faster your response time the greater chance of success. These people that take the time to fill out their information are looking for a quick response. The business owner that responds first usually wins. To recap, to find which channel works best you should either learn the best practices for each channel or hire someone that has had success for each channel. All these channels work in varying degrees. Mauricio Cardenal is the founder of Roofing Marketing Pros. He specializes in helping commercial and residential roofing contractors generate more leads online.